Some types of chopsticks are designed to be packed and carried on trips. Travel chopsticks are chopsticks which are designed to be packed and carried for traveling, allowing their user instant access to a pair of chopsticks as needed. They can be carried on picnics and camping trips, and some people prefer to carry travel chopsticks so that they know that their chopsticks are clean and safe to eat with. Travel chopsticks may also be used in Asian restaurants in lieu of disposable chopsticks provided to patrons. Many Asian markets carry travel chopsticks, in several different configurations, and it is also possible to order them from specialty suppliers. 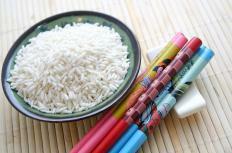 A basic set of travel chopsticks is simply a pair of chopsticks with an accompanying hard or soft case for protection. The chopsticks may be made from wood, plastic, or metal, with lightweight and durable materials like bamboo and titanium being preferable. Bamboo is also convenient for travel chopsticks because it is naturally antimicrobial, resisting the growth of bacteria and fungus. Some companies make travel chopsticks which fold up, break apart, or telescope so that they are more compact. These chopsticks come with a small case to protect the chopsticks during transit. The convenience of folding or telescoping chopsticks is that they take up less room, allowing users to carry them in a pocket. Some are even flat enough to fit into a wallet or slip into a purse, which can make them desirable to some consumers. Some of these designs are quite sleek, with very modern design elements. More inventive companies have made chopsticks with interchangeable heads, often using a magnetic connecting point so that the chopsticks can be quickly and easily pulled apart or put together. These chopsticks may be all metal or a mix of metal and wood, with interchangeable flat or pointed tips, or disposable tips which can be used once and then discarded. Disposable tips can be useful for situations in which it may not be feasible to wash the travel chopsticks. Of course, one does not need to purchase specialized travel chopsticks to carry a pair of chopsticks while traveling. Some people prefer to take along disposable chopsticks which come in their own protective packaging, while others bring regular chopsticks which have been wrapped in fabric or placed into a hard case so that the chopsticks do not break or become dirty. Some markets sell chopstick sets in their own cases, and these can be easily taken on a trip as travel chopsticks. I would just get a normal pair of lacquered chopsticks, rather than "travel chopsticks". They are already quite easy to fit into luggage. And I know people might shy away from using food utensils for other uses but you can use them for all kinds of things as long as you wash them carefully before eating with them. I've used them to keep my pack closed when a button came loose, and to stir a pot and so forth. But you should get good quality ones and make sure they aren't going to snap in your bag. I once bought a sort of swiss army knife that supposedly had a pair of stainless steel travel chopsticks included. It was actually pretty awful. They just weren't really large enough to work properly, and they were joined at the top, supposedly to make them easier to use, but for someone who knows how to use chopsticks, it just made it more difficult. I would recommend, if you were going to get travel chopsticks, to just splash out and get a dedicated pair. It's much better than using disposable bamboo chopsticks, because you at least know where your own pair has been over the years! One of my friends had a set of telescoping travel chopsticks and I thought they were the coolest thing ever! Actually we would often distract children with the chopsticks while we were traveling rather than use them as actual eating utensils. Kids loved playing with them, I guess because they seemed like kind of a high tech gadget. They were quite clever though, as the food never got caught in the bits that moved up and down, and they were easy to wash. I thought it was quite good to have them in your pocket, seeing as it's quite wasteful to use disposable chopsticks, but other kinds of portable utensils aren't nearly so easy and compact.